Some how the word “Adventure” does not seem to complement the words “Luxury Yacht Charter.” Yet, that is exactly what is offered aboard SILOLONA and SI DATU BUA along the Indonesian Archipelago. They are the ultimate luxury yachts from which to venture forth in Indonesia. Luxury Yacht Charter aboard SILOLONA and SI DATU BUA along the Indonesian Archipelago. Often referred to as the “land below the wind,” because it lies between the Pacific and Indian Oceans, Indonesia has the unique weather phenomenon of having no hurricanes or cyclones! The archipelago consists of 14,000 islands sitting about 8 degrees below the equator. Throughout the year, there is a part of Indonesia available for exploring by luxury yacht. Langkawi (Malaysia) Thailand, Mergui Archipelago. We cruised the Komodo Archipelago this past June on a tandem trip with both boats. The yachts’ 5-star service starts when landing at the Bali international Airport after many many hours of flying. Just as we walked off the plane, a representative of the yachts met us and whisked us through a diplomatic customs and immigration area. We never saw a line! She then handed us off to a concierge for baggage collection and transport to our hotel. Charters do not start in Bali- they start in one of the scenic islands, Labuanbajo a short flight down the island chain. As the jet lag coming from the USA east coast was significant, we suggest arriving 2 -3 days ahead of your charter date. We can recommend a few good hotels and resorts in Bali. The yacht owners set up flights on local airlines to get to the boats. Again- concierge service all around was outstanding. Several crew from both boats met us with cold towels scented with lemon grass and bottles of water when we exited the baggage area. Little did we know that these welcomed items would be offered often throughout the cruise. Warm greetings every time we returned. Once aboard and after settling in our cabins, the head guide, Patti Seery, treated us to a brief history of the archipelago. She and Kelly Woolford work aboard both yachts as guides. They make arrangements to meet with local tribes, get into local national park and to find the best diving and snorkeling spots. Traveling the Indonesian Archipelago with Patti Seery is like traveling with royalty. She is known and respected everywhere she goes. Patti has a bounteous passion for Indonesia and has been guiding there for 20+ years. As a guide and a person involved with the local culture, she has earned a status not usually conferred on westerners. She is received as family and welcomed by all. Kelly is also an experienced and respected guide having delved deep into the Indonesian jungles with BBC camera crew to film documentaries. SILOLONA is 164’ traditional Indonesian Phinici cargo boat style yacht built in a shipyard of Kalimantan using ironwood for the hull, rare tropical; hardwoods, aged teak and lengua for the interior.. Built in 2004 as a charter yacht, she sports high quality amenities and high-end cuisine complimented by a superior wine list. Each of the 5 cabins is ensuite and individually air-conditioned. SI DATU BUA is slightly smaller at 132’ and has three cabins for 6 guests. She was built in 2012. As there are 18 crew aboard, SILOLONA and 12 aboard SI DATU BUA the service is always top notch. Each crew member did more than one job and knew our names within 24 hours. The crew are very proud of their boats and handle all the ongoing maintenance. They do not hire outside contractors. In fact, most of the crew participated in the building of these boats in Borneo. Head shipmaster, Nasir, works aboard SILOLONA running the deck and teaching guest how to dance! We snorkeled and dove along untouched reefs brimming with over 260 kinds of coral and 1,000 species of fish. Throughout the week, we encountered enormous Manta Rays, sharks, dolphin and giant turtles. Imagine my astonishment at seeing bright purple starfish! Other watersports available were kayaks, paddling SUPs, and being towed from the dinghy in a variety of inflatable toys. 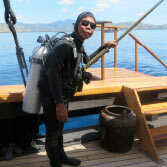 SILIOLNA is a Padi certified dive center which includes equipment for 10 guest ( including 2 compressors). No cruise through the Komodo Archipelago would be complete without a visit to Rinca Island, home to the Komodo National Park, a World Heritage Site and of the infamous Komodo Dragons. These reptiles can weight upwards of 250 pounds yet are quick enough in short bursts to take down a deer or water buffalo. We followed guides carrying forked sticks along well marked trails in search of the dragons only to find out they prefer to hang around the ranger station for food and water. Not surprisingly, the term “here there be dragons,” originated in Komodo. One of our nicest dinners was a barbecue on a secluded beach on Banta Island. The crew brought furniture, umbrellas, food and drink. We were served buffet style while we watched the sun set and listened to the music played by several crew. Indonesian culture revolves around many traditions including daily offerings to gods and ancestors and tribal dances. Patti arranged for us to met with members of a tribe from Flores Island. They welcomed us into their tribe and gave us their protection through a ceremony of sharing alcohol, betel nuts and cigarettes. We were then treated to several ritual dances showing us how young men prepare to be warriors; how two families negotiate a wedding and what happens during the planting season. The music for the dances was played on a variety of instruments including a bass with 1 string. It has been kept this was because that’s the way they found it. The ladies of this village are renown for their hand made and dyed textiles. Each sarong takes up to a year and a half from the day the cotton is picked to the final weaving. We were usually the only two boats at anchor in a bay each evening. The secluded cruising does not allow for much shopping. Yet, we were surprised each evening with a turn-down gift from the boat representing some activity we had done that day. Our final day was highlighted by the arrival of the pearl boat. They followed us for hours until we anchored when they were welcomed by an amazed group of pearl hungry guests. Three young vendors offered stunning displays of necklaces, bracelets and earrings ranging in color from pink to navy blue as well as the standard white and grey. Travelers who enjoy discovering new and exciting places off the beaten path while living aboard a luxury yacht will enjoy a cruise in Indonesia aboard SILOLONA or SI DAT BUA. The yachts have a high rate of repeat guests who re-book to explore areas knowing they will travel in comfort and safety.